Purpose: In order to improve the immunogenicity of whole tumor cell lysate for tumor vaccine, we have designed a series of CpG ODNs to study their transport and to evaluate their anti-tumor activity in B16 melanoma mouse models. Methods: In this study, we investigated whether C-class CpG ODN (CpG ODN-685) could facilitate tumor cell lysate to induce vigorous anti-tumor activity against tumors in mice both prophylactically and therapeutically. Results: It was found that the combination of tumor cell lysate and CpG ODN-685 could inhibit the growth of B16 melanoma and prolong the survival of tumor-bearing mice. Moreover CpG ODN-685 with the addition of tumor cell lysate can also cause the generation of tumor specific immune memory by inducing specific cytotoxic T lymphocytes and helper T lymphocytes in mice. Conclusion: The results suggest that CpG ODN-685 could be developed as an efficient adjuvant for tumor vaccines against melanoma. Effective initiation of specific anti-tumor immunity in vivo or in vitro has been investigated by many scientists1-3. Most of their research has focused on the induction of adequate tumor antigen-specific effector cells. For this purpose, tumor antigens or tumor-associated antigens were prepared in vitro by expressing them to produce recombinant peptides, cloning them to construct recombinant DNA vaccines, or loading them to dendritic cells (DCs) to making DC vaccines4-11. All efforts were devoted to efficiently conjugate tumor antigens to T cells so that immune tolerance could be broken. Many studies revealed promising results for inhibiting tumor growth inhibition and elongation of animal survival in animal tumor models. However, tumor is a multiple genetic disease and targeting one or two signaling molecules in tumor cells may be not enough to inhibit growth12,13. The use of tumor lysate as tumor antigens was developed and utilized for many tumor cell lines in modified ways and proved to be an effective strategy to inhibit growth14-16. Most studies showed undesired results in inducing specific anti-tumor immunity, while others manifested potential anti-tumor effects17-21. The advantage of using tumor lysate as antigens is that it provides a feasible avenue to target multiple sites on tumor cells. Various attempts had been made to enhance the antigenicity of tumor lysate, such as plusing DC to tumor lysate or combining cytokines (e.g. GM-CSF) with tumor lysate. These methods have demonstrated efficacy in some tumor types but not for all. Despite this, the use of tumor lysates as a potential anti-tumor vaccine has proved to be a valuable tool. The transport of CpG oligonucleotides is an important component early in the immune response. We demonstrate that in vivo T cell activation occurs during CpG ODN delivery to the immune system and antigen-specific T cell activation is not associated with presumed cell-associated phase but requires a delivery signal, such as the TLR ligand CpG. To efficiently evoke tumor lysate-induced anti-tumor immunity, tumor lysate antigenicity and immune cell response need to be improved. In recent decades, agonists of toll like receptor 9 (TLR9), such as CpG oligodeoxynucleotides (CpG ODN), have displayed potential as an adjuvant for various vaccines due to their strong immune stimulating activity22-27. Based on their biological activities, CpG ODNs are divided into A, B and C classes. A-class CpG ODN mainly induced plasmacytoid dendritic cells (pDC) to secret large amounts of interferon-α thereby indirectly activating NK cells. B-class CpG ODN strongly stimulated strong B cells, NK cells activation, or cytokine secretion28. C-class CpG ODN share both of the properties of A-class and B-class CpG ODN29,30. To test whether CpG ODN could enhance the anti-tumor effect of tumor cell lysate-based tumor vaccines, CpG685, a C-class CpG ODN, was used as an adjuvant to induce anti-tumor immune response against B16 melanoma in mice. Female C57BL/6 mice were purchased from Beijing Vital River Laboratory Animal Co., Ltd. (Beijing Laboratory Animal Research Center), and maintained in isolator cages under specific pathogen-free conditions. All mice were used at 6-8 week of age. The experimental manipulation of mice was undertaken in accordance with the National Institute of Health Guide for the Care and Use of Laboratory Animals, with the approval of the Scientific Investigation Board of Science & Technology of Jilin Province. Human PBMCs were isolated from buffy coats (Blood Center of Jilin Province, China) by Ficoll_Hypaque density gradient centrifugation (Pharmacia) and washed three times with Iscove's modified Dulbecco's medium (GIBCO). The viability of the PBMCs was 95-99% as determined by trypan blue exclusion. Murine B16 melanoma cells of C57BL/6 origin and Vero E6 cells (African green monkey kidney cell line, American Type Culture Collection) were grown in Iscove's modified Dulbecco's medium (GIBCO) supplemented with 10% heat-inactivated FBS (GIBCO), 0.15% NaHCO3, 100 IUmL-1 penicillin, 100 IUmL-1 streptomycin, and 2 mM L-1 glutamine at 37 °C in humidified air containing 5% CO231. Cultured B16 cells were harvested and washed three times with phosphate buffered saline (PBS PH 7.4). Cells were resuspended in PBS at a concentration of 4×107/ml. Cell lysate were prepared by five cycles of freezing (at -70°C) and thawing (at 37°C) with vigorous mixing using a vortex mixer. Total lysis of all the cells was verified by trypan blue dye exclusion staining. Lysate supernatant and precipitate were separated by centrifugation (1000g for 60 min). The precipitate was diluted in the same volume of supernatant in PBS. B16 cell was used before the fifth passage. Nuclease-resistant phosphorothioate-modified ODNs were synthesized by Sangon Biotech Company (Shanghai, China). The CpG 685 sequence (5'-TCGTCGACGTCGTTCGTTCTC-3'). And it diluted in TE buffer (10 mML-1 Tris, 1 mML-1 EDTA, pH 7.0) using pyrogen-free reagents, and was tested for endotoxin using the Limulus amebocyte lysate assay (Associates of Cape Cod, Inc.). CpG ODN 685 was diluted in PBS when it was used in vivo experiments29, 32. On the day of the tumor challenge, tumor cells were harvested and rinsed three times in PBS. The cells were resuspended in PBS and administered s.c. or i.p. in a volume of 0.2 mL per mouse. In the prophylactic protocol, female C57BL/6 mice (6-8 weeks old) were injected s.c. with 4×106 tumor cell lysate, 50 μg CpG ODN, and 4×106 tumor cell lysate plus 50 μg CpG ODN in 100 μL PBS on day 0, 7 and 14. Control mice were given PBS. On day 16, mice challenged with 2×105 B16 tumor cells through subcutaneously inoculation into the right hind leg (s.c tumor burden model) or 7.5×104 B16 tumor cells through intraperitoneally inoculation into abdomen (i.p tumor burden model). In the therapeutic protocol, mice were injected s.c. with 2×105 B16 tumor cells per mouse (s.c tumor burden model) on day 0 and then immunized with 4×106 tumor cell lysate, 50 μg CpG ODN, and 4×106 tumor cell lysate plus 50 μg CpG ODN on days 2, 9 and 16. Negative control mice were given PBS. The mice were weighed every day, after the tumor had grown to a certain volume, the mice were killed by spinal dislocation; the tumors were removed and the length and width of the tumors were measured with a vernier caliper as well. Tumor measured using the tumor size calculated as follows: Tumor index (%) = [Tumor weight (mg)/Body weight (g)] × 100%. Survival of mice was monitored for 40 to 110 days33. PBMCs incubated with or without CpG ODN (3 μg/mL) for 12 h and cells from abdominal lavage fluid were washed twice with FACS staining buffer (PBS supplemented with 0.5% BSA, 0.01% NaN3 and 100 mM EDTA) and then analyzed for the expression of various cell surface molecules by staining with FITC-labeled anti-CD80 mAbs and CD4, CD8a, NK1.1 mAb (used at 1:100 dilution) respectively followed by analysis of FACSCalibur34,35. Mice were injected with PBS, lysate, CpG ODN, and lysate plus CpG ODN on days 0, 7, and 14. At 10 days after the third immunization, splenocytes were prepared and cultured for 5 days with mitomycin C-treated B16 cells in Iscove's modified Dulbecco's medium (GIBCO) supplemented with 10% v/v FBS and 100 U/mL human IL-2 in a humidified air containing 5% CO2 at 37°C. The ratio of splenocytes to mitomycin C-treated B16 cells was 30: 1. After culture, live cells were isolated by Ficoll- Paque (Pharmacia) density centrifugation and assayed for CTL activity. Cytotoxic T lymphocyte (CTL) activity was measured by a fluorometric assessment36. Briefly, the target cells were first labeled with PKH-26 (final concentration of 2.5×10-6M) according to the manufacture's instruction at room temperature for 3-5min. The labeling was stopped by incubated with an equal volume of heat-inactivated FBS for 1min at room temperature. After being washed with 10ml PBS, the target cells were further labeled with 5-(and-6)-carboxyfluorescein diacetate succinimidyl ester (CFSE). Briefly, CFSE was diluted to a final concentration of 2.5×10-6M and added to the target cell suspension. Immediately following the addition of the CFSE, an equal volume of FBS was added to stop the reaction. Finally, the target cells were washed twice with PBS, resuspended in medium, and dispensed in duplicate at 5×103 cells/well into 96-well U-bottom plates. Effector cells were incubated with labeled target cells at various E:T (effector cells : target cells) ratios at 37°C , 5% CO2 for 5 h. After centrifugation, the cell pellet was resuspended in FACS staining buffer and immediately analyzed by FACS Calibur. PKH-26 positive cells were gated and same cell numbers were acquired for each sample. The percentage of specific cell lysis in the target cell population was determined by the disappearance of the antigen labeled targets from the CFSEHi population compared to the fluorescence of the control targets in the CFSEHi population. To calculate the specific lysis, the following equation was used: specific lysis (%) = [1-(mean CFSEHi of experiment group/mean CFSEHi of spontaneous release)]×100. All in vivo and in vitro experiments were performed at least three times. We used a one-way analysis of variance (ANOVA) to analyze the data shown as mean±SD. Non-parametric analysis was used to analyze the data shown as median. Survival was estimated by the Kaplan-Meier method and evaluated with a log-rank test. A p value of<0.05 was considered statistically significant. All statistical analyses were performed with the SPSS 16.0 software. In this study, we used CpG ODN-685, a TLR9 agonist, as the adjuvant for tumor cell lysate to determine its effect on tumor growth inhibition in mice. As shown in Fig. 1A, the Babl/c mice were s.c. injected with lysate, CpG685, CpG685 plus lysate, or PBS at inguinal groove for three times on day -16, -9 and -2 , and then challenged with B16 melanoma cells i.p. on day 0 (Fig. 1A). Results demonstrated that lysate plus CpG ODN-685 could significantly elongate mice survival time than that of other groups (p <0.05) (Fig. 1B). To observe tumor growth abdominal cavities, on day 16 days post-tumor inoculation, two mice in each group were sacrificed to observe tumor metastasis in the abdominal cavity. The results signified that the tumor had spread throughout the abdominal cavity including the greater omentum, mesentery and diaphragm in mice injected with PBS but not in mice treated with tumor lysate + CpG ODN-685 (Fig. 1C). Histopathologically, a large number of melanoma cells were detected in the omentum of mice administrated with PBS. In contrast, mice administrated with lysate plus CpG ODN 685 showed significantly less changes in their omentum tissue (Fig. 1D). To demonstrate that CpG ODN-685 combined with lysate could initiate specific anti-tumor immunity, mice were injected with lysate only, lysate plus CpG ODN-685, CpG ODN-685 alone, or PBS for three times weekly. Splenocytes were isolated on day 30 after the third immunization and cultured with mitomycin C treated B16 tumor cells for 5d to generate the effector cells. The resulting effector cells were co-cultured with double-stained (PKH26 & CFSE) B16 target cells in ratios of 100:1, 50:1 and 25:1 for 4 h. We also used L929 cells as negative control to B16 target cells (data not shown). The results showed that lysate alone displayed a specific anti-tumor effect whereas CpG ODN-685 alone failed to show specific anti-tumor effect. Expectedly, CpG ODN-685 plus lysate displayed stronger specific anti-tumor response than lysate alone (p<0.01) (Fig. 2A), suggesting that CpG ODN-685 assists lysate to induce tumor antigen-specific cytotoxic immune response. Vaccination of tumor lysate plus CpG ODN s.c to against B16 melanoma in abdominal cavity of mice. C57BL/6 mice were immunized with tumor lysate, CpG ODN 685 or combination of both subcutaneously for three times in a 7-day interval and then challenged i.p. with 7.5×104 B16 melanoma cells after third immunization. PBS-injected mice were as negative control. (A) Procedure of the experiment. (B) The survival curves. Each line represents survival of mice in a group.12 mice were in each group. Kaplan-Meier analysis was performed to test the difference with CpG ODN 685+lysate. *, vs PBS; #, vs CpG ODN 685; ∇, vs lysate. (C) Gross pathological examination of metastatic tumor. On day 16 days post-tumor inoculation, two mice in each group were sacrificed for observing the tumor metastasis in abdominal cavity. The black mass represents B16 melanoma. (D) Histopathological examination of metastatic tumor. The omenta isolated from mice were sectioned for HE stain analysis (200×). Pathological section of greater omenta from mice with or without tumors. HE staining, 200×. The arrow indicated the melanoma cells in omentum. Next, anti-lysate antibody in sera from mice was detected using indirect ELISA with tumor lysate as the coating antigen. Subsequent results demonstrate that serum antibody levels of mice treated with lysate only and mice treated with lysate plus CpG ODN-685 only increased on day 7 after the 2nd immunization. Antibody levels were only significantly increased in mice treated with lysate plus CpG ODN-685 group after the 3rd immunization (p<0.05) (Fig. 2B). To confirm whether CpG ODN plus lysate would induce immune memory to melanoma cells in mice, we selected six tumor-free mice, which had undergone CpG ODN plus lysate immunization three times from day -16, -9 and -2 before B16 cell inoculations, as models after living more than 60 days for observation of specific anti-tumor immune response. The naïve mice were used as negative control. Both experimental and naïve mice were re-challenged with B16 cells (7.5×104). Results demonstrated that all naïve mice died on day 33 after B16 cells whereas no mice died in the lysate plus CpG ODN-685 group (Fig. 3A). This data suggested that CpG ODN-685 could assist lysate in generation ofB16 melanoma specific immunologic memory in mice. Delayed type hypersentivity (DTH) response is generally considered as the primary measure by which mice are able to be immunized to a specific tumor antigen. In light of this, we studied the effect of CpG ODN-685 plus lysate on tumor antigen-specific DTH response. Mice that survived the first tumor challenge after CpG ODN-685 plus lysate treated for 100 d were injected with tumor lysate in left hind foot pad once and with PBS in right hind foot. Serving as a control, naïve mice were injected with tumor lysate in left hind foot and with PBS in right hind foot. Results showed that mice treated with CpG ODN-685 plus lysate and tumor lysate in left foot exhibited noticeable swelling (p<0.05) and right foot with PBS did not exhibit noticeable swelling (Fig. 3B). However, naïve mice did not exhibit swelling in both feet. The results demonstrated that mice treated with CpG ODN-685 plus lysate have the antigen specific to lysate. To determine the specific anti-tumor immunity induced by CpG ODN-685 plus lysate, we next investigated the proportion of activated lymphocytes in the spleens of vaccine mice. C57BL/ 6 mice were immunized with tumor lysate plus CpG ODN-685 s.c. for three times during a 7-day interval. After the 3rd immunization, mice were challenged i.p. with 7.5×104 B16 melanoma cells. At 24, 48 and 72h after tumor cell challenge, the spleens were isolated and then stained with different fluorescence-labeled antibodies to analyze CD4, CD8, NK1.1 and CD4CD25 positive cells by flow cytometry. Mice injected with PBS served as negative controls. CD8 positive cells were decreased in spleens isolated from CpG ODN-685 plus lysate immunized mice at 24h after being challenged with tumor cells, compared to spleens from PBS injected mice. Likewise, spleens isolated from CpG ODN-685 plus lysate immunized mice displayed significantly higher CD4/CD25 positive cells compared to spleens isolated from mice immunized with PBS. In contrast, the number of those cells in the spleens did not change at 48h and 72h. The proportion of NK 1.1+ cell and CD4/CD25 positive cells in mice immunized with CpG 685 plus lysate was lower than that of PBS group at 72h. In contrast, the number of CD4+ cells in the spleens did not changed at 24h, 48h and 72h (Fig. 4). Specific anti-tumor response and T cell response in survivals of mice ever challenged with B16 melanoma cells. The survivals of mice ever challenged with B16 melanoma cells were re-challenged i.p. with 7.5×104 B16 melanoma cells on day 60 after first tumor inoculation or injected with tumor lysate at right foot pads or PBS at left foot pads on day 100 after first tumor challenge. Naïve mice were as negative controls. (A) Survivals of mice rechallenged with B16 melanoma cells. 7 mice were in each group. (B) DTH responses against B16 cell lysate on foot pad of mice ever challenged with B16 melanoma cells. The left is photographs of foot pads and the right is analyzed data of paw swelling. The data are expressed as means±SD (n=3). Significant difference between naïve and immunized group was determined by one way ANOVA test. 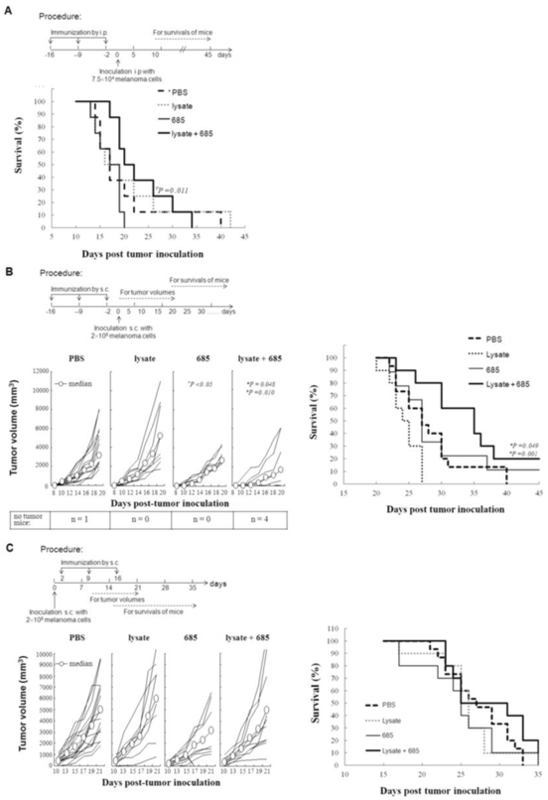 Different lymphocyte ratio in splenocytes of mice immunized with tumor lysate plus CpG ODN. C57BL/6 were immunized with tumor lysate plus CpG ODN 685 s.c. for three times in a 7-day interval. After third immunization, the mice were challenged i.p. with 7.5×104 B16 melanoma cells. Mouse spleens were isolated before tumor cell challenge, or 24h, 48h and 72h after tumor cell challenge and then homogenated for preparing splenocytes. The splenocytes were then stained with different fluorescence-labeled antibodies for analyzing CD4, CD8, NK1.1 and CD4CD25 positive cells by flow cytometry. PBS-injected mice were as negative controls. 8 mice were in each group. (A) Percentage of CD4+ cells in splenocytes. (B) Percentage of CD8+ cells in splenocytes. (C) Percentage of NK1.1+ cells in splenocytes. (D) Percentage of CD4+CD25+ cells in splenocytes. Next, we investigated the kinetics of lymphocyte around the local site of tumor burden and the infiltration of lymphocyte in the greater omentum and peritoneal lavage. Cells from peritoneal lavage were stained with different fluorescence-labeled antibodies to analyze CD4, CD8, NK1.1+ and CD25 positive cells by flow cytometry. PBS-injected mice were used as negative controls. The proportion of CD4+ T cell was much higher in mice immunized with lysate+CpG685 than the control group at 24~48h. This number decreased at 72h and eventually became lower than that of the PBS group. For CD8+ T cells, the cell number increased at 24h but decreased at in 48h. The cell number of CD8+ T cells in lysate + CpG ODN-685 group was higher than that of PBS group (Fig.5B). For NK1.1+ cells, the cell number increased at 24, 48, 72h mice immunized with lysate + CpG ODN-685 group, particularly in 48h (p<0.01 vs. PBS group). CD4+/CD25+ cell increased significantly at 24h in mice immunized with lysate plus CpG-685 but significantly decreased at 72h (Fig. 5D). And there were no significantly difference between PBS group and lysate only or CpG ODN-685 only group (data not shown). These results showed that NK cells may play an important role in early process of tumor formation and the anti-tumor effect of lysate + CpG ODN-685 may be through the alteration of CD4+/CD25+. To further determine the efficacy of CpG ODN-685 plus lysate, mice were inoculated with B16 cells. Intraperitoneal injection tumor model was used to value the effect of CpG ODN-685 in assisting tumor lysate to induce anti-tumor immunity in mice. The immune procedure for prophylactic administration and therapeutic model were the same as the metastasis model. The tumor volumes and survival rates of mice were calculated after tumor challenge. Results showed that immunization with lysate + CpG ODN-685 can extend the survival of mice (p<0.01 vs. CpG ODN-685 group, Fig 6A). The subcutaneous tumor model was used to evaluate the effect of CpG ODN-685 in assisting tumor lysate to induce anti-tumor immunity in mice. Tumor growth in mice immunized with lysate + CpG ODN-685 was significantly inhibited compared to mice immunized with either PBS or lysate (p<0.05 vs. PBS; p=0.010 vs lysate). Tumors grew significantly slower in lysate + CpG ODN-685 compared to mice immunized with PBS and lysate but there was no difference with CpG ODN-685 alone (Fig. 6B). 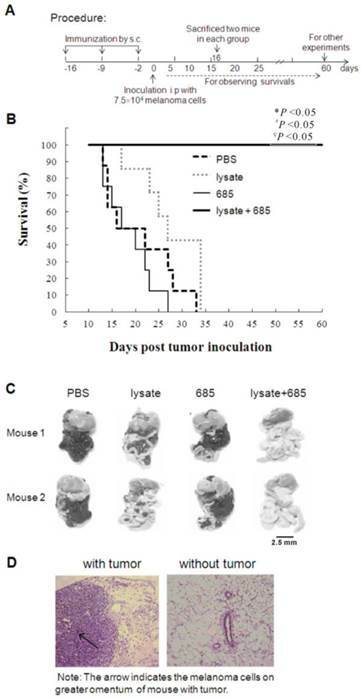 There was no tumor growth in 4 mice that were immunized with lysate+CpG-685 for 20 days after anti-tumor immunity and the rate of tumor was 100% in the group of CpG ODN-685. Cumulative survival showed a similar trendency in tumor growth. In addition, immunization with lysate + CpG ODN-685 could significantly elongate the survival rate of mice (p=0.049 vs. PBS; p=0.001 vs lysate), whereas immunization with CpG ODN-685 alone had no effect (Fig. 6B). Different lymphocytes in lavages of omentum and peritoneum in mice immunized with tumor lysate plus CpG ODN. C57BL/6 were immunized with tumor lysate plus CpG ODN 685 s.c. for three times in a 7-day interval. After third immunization, the mice were challenged i.p. with 7.5×104 B16 melanoma cells. The mice were sacrificed for collecting lavages of omentum and peritoneum by rinsing with PBS. The lavages were centrifuged for getting the lavage cells. The lavage cells were then stained with different fluorescence-labeled antibodies for analyzing CD4, CD8, NK1.1 and CD4CD25 positive cells by flow cytometry. PBS-injected mice were as negative controls. (A) Percentage of CD4+ cells in lavage cells. (B) Percentage of CD8+ cells in lavage cells. (C) Percentage of NK1.1+ cells in lavage cells. (D) Percentage of CD4+CD25+ cells in lavage cells. Using the in therapeutic model, mice were injected with B16 tumor cells s.c. on 0d and then immunized with tumor cell lysate with CpG ODN-685, or tumor cell lysate + CpG ODN-685 on the day 2, 9 and 16. 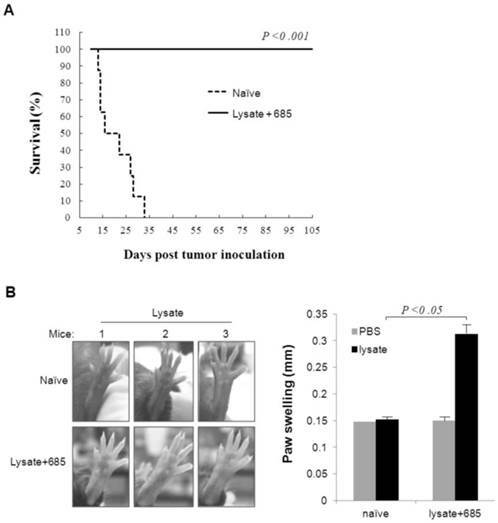 Results demonstrate that immunization of lsyate+ CpG ODN-685 didn't protect mice from tumor growth and didn't extend the survival time (p>0.05) (Fig. 6C, D). These results reveal that CpG ODN-685 is effective in assisting tumor lysate induction of anti-tumor effect when used in subcutaneous tumor model mice. In this study, we have shown that CpG ODN-685 demonstrates characteristics of the C-class CpG ODN, which could facilitate tumor cell lysate to induce vigorous anti-tumor activity against tumors in mice both prophylactically and therapeutically. It was found that the combination of tumor cell lysate with CpG ODN-685 can inhibit the growth of B16 melanoma and prolong the survival of tumor-bearing mice. In addition, CpG ODN-685 plus tumor cell lysate can cause the generation of tumor specific immune memory by inducing specific cytotoxic T lymphocytes and helper T lymphocytes in mice and these T cells may have higher affinity. C-class CpG ODN shares both the structural characteristics and biological functions of A & B-class CpG ODN. The CpG ODN-685 sequence differs from the A-class sequence 2216 (5'GGGGGACGATCGTCGGGGGg3') in its primary structure. However, the CpG ODN-685 sequence is similar with C & B-class CpG ODN. Our previous work showed that C-class CpG ODN could induce the production of mixed IFNs including IFN-α, IFN-β, IFN-γ and at least 11 subtypes of IFN-α37. The importance of NK cell mediated anti-tumor immunity was supported by the evidence that NK cells activated by A-class CpG ODN could induce tumor rejection in a variety of mouse tumors, especially weakly immunogenic tumors such as melanoma and fibrosarcoma38-40. CpG ODN-685 can promote human PBMC cells to enhance CD80 and CpG ODN-685 thereby enhancing HLA A2. It is important for the antigen to be presented efficiently to Th cells. It has been demonstrated that both IFN-α and IFN-γ directly induce cytostatic effects on tumor cells. Indirectly, IFN-α/β activates innate immune cells including NK cells and macrophages to kill tumor cells. Good antigen delivery systems could target antigen presented cells and prolong antigen presentation by preventing degradation. Regarding the mechanisms of adjuvant action, CpG ODN-685 possesses high efficiency to induce an early and strong cytokine and chemokine-rich environment at the site of injection. CpG ODN-685 can also activate NK cell in the experiment of CD69 expression in PBMCs. These results suggest that CpG ODN-685 is a valid inducer of natural immune response as well as adaptive immune response and that CpG ODN-685 can be used for anti-tumor research. Noticeably, CpG ODN-685 can inhibit tumor growth upon subcutaneously injection into the tumor draining lymph node (TDLN) area in mice. Comparing results from the in the prophylactic model, we found that using CpG ODN-685 alone was more effective. This may be attributed to the ability of tumor cells to provide sufficient tumor antigen upon CpG ODN usage. Based on our results, in vivo subcutaneous or intraperitoneal injection of CpG ODN-685 or tumor cell lysate could not trigger an effective anti-tumor immune response. However the combination of tumor cell lysate with CpG ODN-685 can lead to an effective immune response. This suggests that both CpG ODN-685 and tumor cell lysate play a role in this immune response. The role of tumor lysate plus CpG ODN on tumor inhibition in different mouse model by different immunization manner. 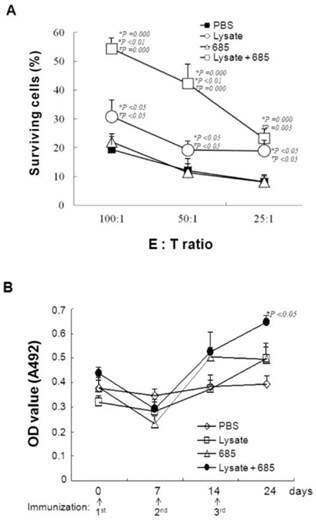 (A) Survivals of mice immunized by i.p followed by challenge of B16 melanoma cells by i.p. shown in the experiment procedure. (B) Tumor volumes (left) and survivals (right) of mice immunized by s.c. followed by challenge of B16 melanoma cells by s.c shown in the experiment procedure. (C) Tumor volumes (left) and survivals (right) of mice challenged s.c. with B16 melanoma cells followed by immunization s.c. shown in the experiment procedure. *, vs PBS; #, vs CpG ODN 685; ∇, vs lysate. Analysis of lymphocyte transformation in different tumor inoculation locations, suggests that CD4+/CD8+ T-cells significantly increase within 24~48 h after tumor inoculation. However, there was little change in NK cells or Treg cells. Upon tumor inoculation, it indicated that CD4+/CD8+ may be involved in this immune response. Results from the CTL assay showed that CD8+ T cells have immune activity. Using CpG ODN-685 alone did not cause an effective CTL response, but CpG ODN-685 combined with tumor cell lysate generated specific CTLs. However, further studies of CpG ODN-685 as an adjuvant for cancer immunotherapy are limited. Our results showed that CpG ODN-685 combined with tumor cell lysate could generate strong T cell responses against B16 tumor cell. Considering tumor cell lysate alone can't effectively cause anti-tumor immune response in mice, we hypothesize that besides CD8+ T cell, lymphocytes are also involved in anti-tumor response. DTH data on mouse survival showed that the degree of foot pad swelling in mice within the combination group was much higher than that of control group. This indicates that CD4+ T cells are involved in the immune response. CTL and DTH data suggested that CD8+ T cell and CD4+ T cell are involved in the immune response which cause by the combination of tumor cell lysate with CpG ODN-685. From these results, we concluded that the combination of tumor cell lysate and CpG685 can induce differentiation of CD8+ T cells, and this effect was under the assistance of CD4+ T cells. These results, however, were different from other results. For example, the combination of CpG1826 and peptide vaccine caused by CD8+ T cell response is not dependent on the assistance of CD4+ T cells. In addition, specific CTLs caused by soluble protein vaccines plus CpG ODN did not require the helper T cell pathway41,42. So we believe that CpG ODN induction of different immune responses may be associated with different types of tumor antigens. Furthermore, we observed CD4+ and CD8+ T cell levels were enhanced in both PBS and combination groups. We presumed that lymphocytes increase could produce an effective immune response, so tumors must be inhibited effectively in these two groups, but the results suggested otherwise. Therefore, we hypothesized that the number of lymphocytes increased when an organism received the external stimuli. Whether these increased lymphocytes could induce the anti-tumor effects or not may depend on the level of lymphocyte affinity. High-affinity CD8+ T cells were more effective in B16 tumor cell inhibition than that of low-affinity CD8+ T cell. Otherwise, invalid T-cell activation could lead to a reduction in T cell proliferation. In addition these proliferating cells played a weak role in killing tumor cells and led to tumor tolerance. Therefore, we presumed that CpG ODN-685 combined with tumor cell lysate can be more effective in T cell activation, and these T cells may have higher affinity. This work was supported by the National Nature Scientific Foundation of China (81471888) (81200145) and Science and Technology Department Foundation of Jilin Province (20140311090YY).